Is there anything more comforting than a plate of grits? They're soft and creamy and go down so easy. 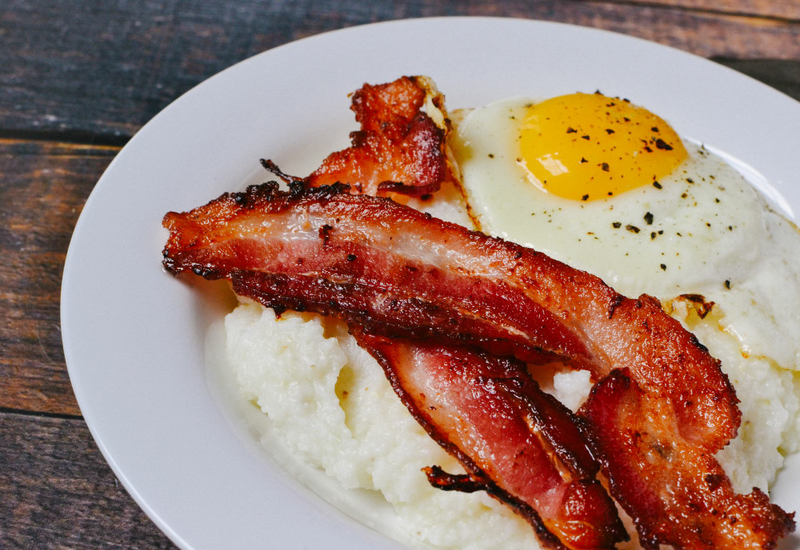 This simple breakfast bowl recipe takes Southern-style buttermilk grits and tops it with sliced bacon and a fried egg. It's definitely one of those stick-to-your-ribs type dishes that will keep you fueled for hours. Grits are also an excellent choice for those who are celiac or have a gluten intolerance, or maybe are just sick of oatmeal. You can prep the grits in advance for busy weekdays or make them on the weekend with an array of toppings. Why limit yourself to just eggs and bacon? You can certainly add other toppings to get even more flavor into your breakfast bowl. Try shredded cheese, green onions, and maybe even hot sauce. Or add some Mexican flair with chopped chiles, tomatoes, and cilantro. Per Serving: 757 calories; 45g fat; 55.5g carbohydrates; 32g protein; 295mg cholesterol; 3701mg sodium. I made this bowl and it was so good! I added cheese and green onions to mine. I love the convenience of just throwing everything in a bowl and eating it together. Sometimes I crumble my bacon up in the bowl too! I eat this for breakfast regularly, there's not a whole lot to it. My husband always debate whether or not sugar goes in grits. I say no, but of course he adds a ton to his bowl! Is it terrible that I used instant grits here? I also coarsely chopped the bacon, used scrambled eggs, and added cheese. Quick and simple. Hands down my favorite breakfast for Saturdays. I used the whipped scrambled eggs also from this website with the grits and bacon. It was perfect. This is really just a recipe for buttermilk grits. I like to add sugar (don't judge me), it was pretty good. I had never used buttermilk in grits before. Great tasty recipe for stovetop grits, (and serves a lot more than just one,) but I was looking for one to make in my Mealthy Multipot!